Cuban Masonic History - Grand Lodge of Cuba of A.L. and A.M. The rich masonic history of Cuba is so extensive that we are forced to show in this writing a summary of all of them, that is, the most relevant points, which allow us to show the world how great it has been, is and will be. fraternity in Cuba. Freemasonry is not a political organization, although sometimes its members were persecuted for political reasons. Nor is it a religious sect, although its adherents confess an absolute faith towards its principles. In the past the Catholic Church treated them as heretics and many monarchies considered them a fatal threat to their crowns because of their insistent vocation to oppose any religious or political tyranny. However, even today, when humanity seems to have lost its sanity, the freemasons meet and work regularly with the hope of redeeming it. But, undoubtedly, Freemasonry has already left behind its most glorious moments, when the names of great writers, musicians, and thinkers prestige their ranks. Far away has been that golden age when Mozart wrote his Masonic cantata “The praise of friendship”, inspired by the ideals of brotherhood, or French revolutionaries shouted through the streets of Paris the freemason motto of Liberté, Egalité, Fraternite But from George Washington to Benito Juárez (without forgetting Walt Disney), the social influence that this fraternal association has had on modern history is undeniable. In Cuba, Freemasonry also has an illustrious past, inextricably linked to the formation of nationality itself and in its ranks military men who then fought for the independence of the country. Perhaps many think that their ancient rites and liturgies no longer agree with the postmodern world and that, as an institution that aims to achieve the improvement of society, but without promoting social changes, it is obsolete. Paradoxically, Freemasonry on the island now has a growing membership, so it is not idle to reflect on the role of this institution in the history of the nation and its undeniable resurgence at present. The first article, paragraph I of the Cuban Masonic Constitution states that “Freemasonry is the organic institution of morality”, morality understood as respect for oneself and the society in which it is based, and this criterion represents the aspiration to a style of life for which Freemasons must be distinguished, not only within the fraternity, but also in any environment where it is found. There has been much speculation about the birth of Masonic fraternities. Some argue that Freemasonry dates back 4,000 years A.N.E. and consider as an illustrious ancestor Hiram Abif, the master of constructive arts that King Tiro sent to the biblical Solomon to direct the building of the temple consecrated to Jehovah. Others attribute to it an origin where the druidic precepts, bards and Christians, legends and Germanic myths, mixed with the mysteries of Greece and Egypt, are amalgamated. In 1717 the four London lodges, heirs to those medieval guilds, constitute the “English Grand Lodge”, which marks the birth of modern Freemasonry that spread rapidly throughout Europe and reached greater strength at the end of the eighteenth century, mainly in England, Germany and France, where very soon the word Mason was synonymous with revolutionary: the emblem of honor raised by the freemasons was the same trilogy acclaimed by the French who took the Bastille in 1789. As if that was not enough, that currency also inspired the rise of the Spanish liberals – among which there was a good number of freemasons – that aspired to regenerate the Iberian nation and to reestablish the Fundamental Code of Cádiz in 1820. It reached such a point that there were “republican” and “realistic” lodges “according to your tendencies. This aspect of Freemasonry, considered irregular due to its meddling in political affairs -and which according to Masonic orthodoxy distorts the true objective of the organization and far from benefiting it, harms it-, at a certain moment it had a great influence on the secret societies that they were trained in Cuba, where they were transmitters of the doctrines that perfectly fit the separatist ideas and the conspiratorial aims of the Creoles, already in the dawn of the last century. Although some Masonic activity existed in Cuba since the end of the 18th century, led by the French emigrants from Haiti, it was not until the 19th century that the first lodge was founded on the island by a Frenchman living in Santo Domingo, and named Joseph Cerneau. “The Temple of the Theological Virtues No. 103” was established in Havana, with a patent letter from the Grand Lodge of Pennsylvania, in the year 1804 of the Vulgar Era, and this is followed by the founding of other lodges such as “L`Amitié “and” Benefice Concorde “. Although Cerneau had to leave the country quickly, accused of revolutionary instigator; the freemasonry that he had inaugurated, spread rapidly. It was Masons of democratic ideas that fostered the first plot for the emancipation of the country in 1809. But the way things happen in the swashbuckling movies, the conspiracy was discovered by the denunciation of a priest who had no scruples in betraying the secret of confession of a devout fearful lady for the life of her husband involved in the facts. One of the conspirators, the lawyer Joaquin Infante, freemason of separatist ideas, came to elaborate even what is considered the first Draft Constitution for the future Republic of Cuba, a document that carried in his spirit the most advanced ideas of the era, but who was not lucky enough to fulfill his destiny. Thus, the political persecution is also joined by the decree issued in 1812 by the Regency Council of Spain and the Indies, which declared the Fraternal Order illegitimate in the overseas possessions of the Metropolis, and since then Freemasonry is considered a crime of state. With the reestablishment of the constitutional regime in Spain, Cuban Freemasonry begins to reorganize. In 1818 the first body of High Grades was created in Cuba, the Great Consistory of the 32nd degree of the Old and Accepted Scottish Rite, founded with a French patent by Luis Juan Lorenzo de Clouet D ‘Obernay, which brought together three symbolic lodges that went to work for the Scottish system. Two years later, from 5 symbolic lodges, the “Grand Lodge of the Rite of York” was founded, around which the criollos were mainly grouped. Later, by successive mergers of this and other symbolic bodies is constituted a Sovereign Grand Lodge representative of 66 lodges, which gives unity and independence to the symbolism, which also represents an act of rebellion towards the Grand National Orient of Spain, who intended to exercise his dominion over Freemasonry on the Island. After the return of absolutism in Spain, the colony-metropolis contradictions are sharpened and conspiratorial airs go back, which in many cases have a clear Masonic roots. This was the case of the Conspiracy of “Soles y Rayos de Bolívar”, headed by the Havana-born José Francisco Lemus y Escámez, colonel of the Colombian armies and whose purpose was to found the Republic of Cubanacán. Most of those involved were Freemasons and the organization itself had a warp and thought based on Masonic ideals. Captain General Francisco Dionisio Vives penetrates the organization and the complicated ones are prosecuted by conspirators, although the Masonic affiliation of the accused is not mixed. According to Vives himself there were 12 thousand Masons on the Island at that time. In 1830 a new cause is opened, this time by infidelity and freemasonry, to the conspirators of the “Great Legion of the Black Eagle”. Apparently with this process closes the first great cycle of struggles to make the island independent and to organize Freemasonry, because in 1834 the lodges are declared illegal again and all traces of Freemasonry organized in Cuba are lost. The pro-independence movement works in secret organizations with a certain Masonic character but they are not properly Masonic lodges. In 1862, Dr. Vicente Antonio de Castro founded the “Grand Orient of Cuba and the Antilles” (GOCA), with the supposed objective of regularizing Freemasonry. According to the historian Eduardo Torres Cuevas, the liturgies of degree 33 created by Vicente A. de Castro were essentially socio-political and not only philanthropic-fraternal. As a result, in the 60’s the GOCA became the transmitter of a “democratic, laical, republican and independent project that channeled and allowed to give dimension to the concerns of the youth of its time” and was extremely important as a prelude to the outbreak revolutionary of 68, as it would provide two notable elements: “a secret organization that served as a link to those who prepared the insurrection” and “a harmonically structured proposal for the transformation of colonial society into a new and independent”, because when drafting These liturgies, its author made it clear that it was a system of social pedagogy and its objective was to train men capable of responding to the social problems of the country. Some of the principles contained in the 27th degree are also revealing and that according to Vicente Antonio de Castro, he had to defend and even conquer Freemasonry: sovereignty of the people, freedom of work, religious, and person, sovereignty of nations, right of assembly and social equality, among others. Due to the contradictions that had to do both with a methodological problem of functioning and with the own political tendencies existing in the country, regular Freemasonry is radically opposed to this Masonic body and finally the Supreme Council of the United States. disqualifies the GOCA for lacking due authorization for its foundation and because its purposes -according to this Council- were “entirely political”. But the seed was planted, because the most outstanding figures of the 68 began in the GOCA. Maceo, belonged to him since 1864, Agramonte and other illustrious Camaguey began in the lodge “Tínima No. 16”, and in Bayamo “La Estrella Tropical No. 19” grouped among others Perucho Figueredo, Francisco Vicente Aguilera and Carlos Manuel de Céspedes who later founded under dispensation the lodge “Buena Fe”, in Manzanillo, and whose library was considered one of the most complete in Cuba regarding the subject of Freemasonry. When these men go to the jungle and elaborate the documents that will make known the objectives and projection of their actions, they have as a point of reference the ideas that had already been handled in the GOCA liturgies. At the outbreak of the war of 68 increases the hostility of political and religious authorities to Freemasonry and, although the institution can not be considered as a homogeneous whole, due to the contradictions and splits that suffers at this time, the whole body suffers the consequences of the chasing. Many Freemasons are imprisoned and the Grand Master of the “Grand Lodge of Columbus”, José Andrés Puente Badell, is shot, as well as other brothers, with no other charge than the crime of Freemasonry. As a result of the persecution they recess for a time the works of the “Grand Orient of Columbus” in both branches, symbolic and philosophical, until its reconstitution was undertaken in 1871. There is reference to the fact that despite the harsh conditions imposed by the war, so-called militia lodges were founded to be constituted in the middle of the jungle: “Tínima 16”, “Camagüey” and “La Independencia”, the latter founded by Céspedes in 1870. According to testimonies, the “Independencia” lodge functioned for almost three years, and the way of celebrating the celebrations was always sought, respecting the Masonic ritual as if they were in the most sumptuous temple. The tools were transported in a mule that they called “the Mason” due to their functions, until during a skirmish the mule fell into enemy hands; but this lodge did not disappear as much because of the adverse conditions for its operation, as for the internal struggles that divided the top leaders of 68 and that ultimately influenced the failure of the insurrection. The persecution of the Spanish authorities to the most prominent freemasons in their independence ideas reaches unsuspected limits when former members of the “Buena Fe” lodge are tried for the crime of Masonry and Céspedes is condemned in absentia, as Venerable Master of this lodge, to 11 years of major prison, although he had already died in 1873. Regular masonry was reorganized in 1871, when the “Gran Oriente de Colón” was reconstituted, which is recognized by the “Grand Orient of Spain”. In spite of this, in 1875 the representative of the great Orients of America, Ramón Bru Lassús, declared the official relations interrupted and immediately proceeded to found lodges in Havana, invading the jurisdiction and without faculties for it; It established the workshops “Cuba Española”, “Unión Ibérica” ? ?and “Hijos de Covadonga”, claiming that it cut the resources that the “Gran Oriente de Colón” secretly sent to the Creoles who fought against the metropolis. In that same year this incident is resolved, as Bru is dismissed from his position and relations are resumed. He is suspected of political intentions and personal gain. The Masonic Convention of Lausanne held in 1875, attended by a representative from Cuba, made important agreements for the development of Cuban Freemasonry. One would be the recognition of the regular and legitimate existence of the “Supreme Council of Columbus” as a sovereign and independent power, regardless of whether the island was not politically of Spain. In the second place it is stated in this Congress that the Supreme Councils were empowered to stop exercising the command in the three symbolic degrees, which favors the signing of a Treaty of Friendship and Mutual Recognition of powers and attributions, between the “Supreme Council de Colón “and the” Symbolic Grand Lodge of Colón “. On August 1, 1876, the “Grand Lodge of the Island of Cuba” was founded in the west of the country by Aurelio Almeida and González. To become strong this new body signs a pact of mutual respect with the Spanish Orients. In spite of this, in 1878 the members of the Grand Lodge are accused of being disaffected to the Spanish regime and are required to be held accountable for their actions. The response of the great teacher Gregorio González Amador and Aurelio Almeida as a great secretary is courageous, when they are clarified that they lack authority over the Grand Lodge and, as a consequence, a few days after the Zanjón Pact, they break relations with the “Grand Orient” from Spain”. During the Pact of Zanjón, regular masonry had to respect the political government of the nation. However, during this period, the “Obreros de la Luz” lodge was founded with railway elements, among whose members was Julio Sanguily, who collaborated with the revolution carrying documents and messages for the preparation of the Chiquita War and later He provided help to Calixto García for his departure from the country. Also for similar purposes, the “Plus Ultra” and “Evolución” lodges were created, the latter bringing together many of the restless young people of the Acera del Louvre. It is at this time when the symbolic Freemasonry is restructured, because after successive mergers between the Grand Lodges, in 1891 the “Grand Lodge of the Island of Cuba” emerges as the sole and sovereign symbolic organism. The following year is also achieved the integration of a single Supreme Council to govern Freemasonry High Grades. In the emigration, fraternal nuclei were also established that contributed much to the cause of independence. In Cayo Hueso the loggia “Felix Varela No. 64” was founded and later the “Francisco Vicente Aguilera”, from which it is elected as V.M. the patriot Fernando Figueredo Socarrás. In New York he works “La Fraternidad No. 387”, to which Benjamín J. Guerra and Gonzalo de Quesada y Aróstegui, treasurer and secretary, respectively, of the Cuban Revolutionary Party founded by Martí, who in turn had started in Spain, would belong. , from very young, in the lodge “Harmony”. With all these data, it is to be assumed that not only were the cigar makers a great collaborator of the Martian effort, but that the exiled Freemasons were also an important pillar in the preparation of the necessary war. Later, when the 1895 uprising was decided, it was Juan Gualberto Gómez, patriot and mason, whom Martí appointed to start the uprising in Cuba and illustrious patriots and freemasons were the signers of the Montecristi Manifesto. The flag that today represents the Cuban nationality had flown for the first time on May 19, 1850 in the Bay of Cárdenas, where Narciso López disembarked at the head of an expedition of 600 men. The company failed in its objectives but Lopez would repeat his attempt, which would eventually cost him his life, but his death would consecrate the flag that he had created with so much love. Today it is quite known who was the author of the banner although its genesis is less publicized, inspired by Masonic symbology. 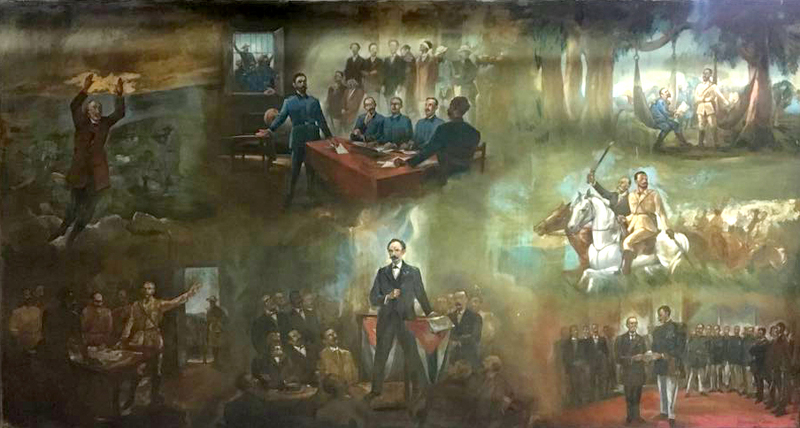 According to the testimony of Cirilo Villaverde, at the beginning of 1849, several Cubans who supported the separatist cause were accustomed to meet in the house of the also freemason and poet Teurbe Tolón. In one of these gatherings, ideas for the development of the Cuban pavilion began to be handled. Narciso López proposed three blue stripes in a white field, representative of the three military regions in which the country was divided. For the red color, according to Villaverde (…) “López, who was a freemason, naturally chose the equilateral triangle”, which symbolizes the greatness of the power that assists the Great Architect of the Universe and whose equal sides allude to the Masonic symbol of freedom, equality, fraternity and the tripartite division of democratic power. The five-pointed star signifies the perfection of the Masonic master: strength, beauty, wisdom, virtue and charity. The flag also includes in its integration the three symbolic numbers. The three (three blue stripes) represents the perfect harmony; the five, the result of the sum of all the strips, means the vivifying spirit, which perpetuates nature; and the seven that is obtained by adding the triangle and the star is a number considered divine by the Jews and the Greeks. At the end of the Spanish colonial period, Cuban Freemasonry begins a new stage. Throughout the previous period he has had to struggle to define the boundaries between Scottism and symbolism, has faced political persecution, and in many opportunities has facilitated the conspiratorial activities of the Creoles and, only now, after four years of forced recess , but favored by the new circumstances, will be able to take care of putting order in his own house and to specify his destiny. Although the masonic work resumed, one of the greatest difficulties that the members had to solve was the lack of resources, the institution devoted itself to creating decent conditions for its facilities and undertook various works that responded to the exposed interests. In 1917 Freemasons saved from bankruptcy to the asylum of children and elderly La Misericordia that exists to this day with the name of “Masonic National Home Llansó” and later assume works such as the shelter of the House of Charity of Matanzas and Children’s Asylum José María Casal, besides the creation of the Masonic Relief, as a way to help the relatives of deceased Masons, which still exists today. Likewise, various institutions are created, such as the Masonic Groups, the School Shoe and the Masonic Costume – both with the aim of helping public schools and families with limited resources – the Masonic National School, for orphaned children of Masonic parents, and the José Martí Masonic University, all as a way to cooperate with the cause of education in the country. The Association of Young Hopes of the Fraternity (AJEF) was also organized, with the purpose of ensuring the moral, physical and intellectual development of young people. From the organizational point of view, the recovery of Cuban Freemasonry is palpable. The Grand Lodge and the Supreme Council of the 33rd degree for the Republic of Cuba ratify and extend the Treaty of Friendship and Mutual Recognition that existed between them, and in 1947 some divisions that internally weakened both bodies were definitively solved. In the decade of the fifties, the Grand Temple, the headquarters of the Grand Lodge, was built, where today there are important facilities such as the Masonic Museum – which holds various objects related to the history of the country – and the Library of the Grand Lodge. The prestige and social recognition that Masonry achieved allows it to increase its influence on the life of the country. This is demonstrated by his opposition to the Education Reform Project of 1956, which called for the inclusion of religious education in official education. Consequently, with their principles of religious freedom, the Freemasons issued a statement in defense of secularism and came out successful in their claim. During the first years freemasonry supports the new government and its revolutionary measures, but the radicalization of the process results in some of its high officials leaving the country. The Ex-Grand Master J. J. Tarajano founded in the United States the Grand Lodge of Cuba in exile, which was recognized at the Conference of Grand Masters held in Washington. The Cuban Freemasons proclaim that the Grand Lodge based in Havana is the only and true representation of the Cuban regular masonry and this fact is finally recognized in the V Conference of the Inter-American Masonic Confederation. During this time, Freemasonry began to face difficulties: they significantly decreased their financial resources and saw limited many of their private philanthropic efforts, due to the profound changes that have occurred in the country. To this is added the exodus to the outside of a part of its members, while very few young people were interested in entering the institution and preferred to devote themselves entirely to a process that promised to fulfill with all that the freemasons have always raised as his biggest currency: “Freedom, Equality, Fraternity”. Of 34 thousand members in 1959, the figure had been reduced to 19,582 in 1981. But when it seemed that the fate of Freemasonry in Cuba was to languish quietly until its total extinction, signs of recovery begin to register. Since 1982, there is a slight growth that will not stop until the present, when its membership amounts to more than 28 thousand members. In recent years the international participation of Freemasonry in Cuba has grown significantly and the recognition it receives in the universal concert of the Institution: the Grand Lodge of Cuba (through its then Grand Master) served as Vice President of the Confederation Masonic Interamericana years ago, presiding over the Second Zone that includes the Grand Lodge of the Caribbean. (1) The denomination “of Columbus” refers to the territory discovered by the great Admiral Christopher Columbus. (6) Agreement taken by the First National Congress of History, held in Havana in 1942.